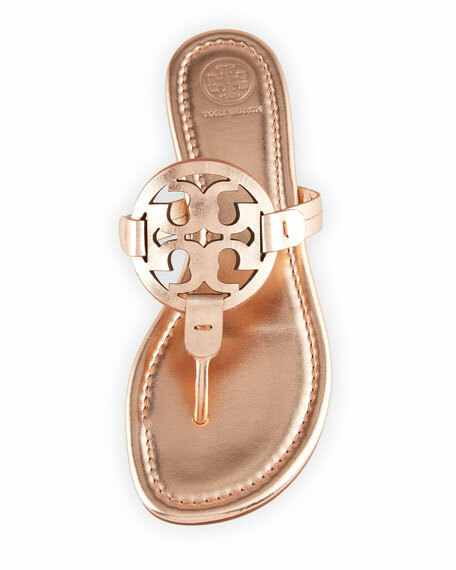 Tory Burch metallic leather sandal with logo medallion covered vamp. EXCLUSIVELY AT NEIMAN MARCUS Jimmy Choo "Lela" sandal in soft napa leather. Ruched, crossover bands. Flat heel. Slide style. Leather sole. Made in Italy. Sizing note: Jimmy Choo runs small. We suggest that you order a half size larger than you typically wear. Saint Laurent napa leather espadrille flat. 0.8" braided flat jute heel. Jute-capped round toe. Logo detail on vamp. Pull-tab at backstay. Slip-on style. Rubber sole. Made in Spain. Fit note: Saint Laurent shoes run small. Please order a 1/2 size larger than you typically wear.